Well we’re halfway through Lent! Congratulations for making it halfway. I’m always amazed, you know, in this age of technology we can tell how many people stopped, when they stopped. We can tell if people watched twenty seconds of a video or all of a video. We can tell what percentage of people watch a whole video versus what percentage of people tune out of a video. We can tell how many people last seven days of the program, how many people make it halfway, how many people make it all the way. And resistance will slay a lot of people along the way. But resistance hasn’t slayed you yet, and so I want to congratulate you for making it halfway. We’re praying for you. Make it all the way through Lent on this great, great spiritual journey we’re having together, to create the Best Lent Ever. One of the central experiences of our faith is the experience of Mass. I fell in love with the Mass on Tuesday nights. There was a Mass every Tuesday night in our parish and and my spiritual mentor really challenged me to go to Mass one weekday each week. And I am, I'm not a morning person, at all. So in our parish, Mass was at six thirty in the morning, every morning. And um, I used to have to get up to go for that as an altar boy, when I was a little kid. But certainly when I was seventeen, I wasn’t getting up for the six thirty Mass. So I used to go Tuesday nights. They used to have Mass at 7:30, and it was probably, only, I don’t know, a dozen people. They had it in the big church. It probably held 800 people. And it was a very intimate experience and in that intimacy I experienced the Mass differently. But I think the big thing is, I started to listen differently. I listened differently to the prayers. I listened differently to the homily, which was always just this one minute homily. Our priest would give this one minute homily it was just like, one thing to think about. It was beautiful. It was powerful. And I used to listen differently to the Mass on that Tuesday night. And I don’t know what that was. I don’t know if it was intimacy, I don’t know if it was the absence of all the distractions. I don’t know what it was, but it was different for me and it really had an enormous impact on me. I got a challenge I like to give to people. I like to challenge people with this because I think it changes their lives. I think it transforms their faith experience. And I want to present that challenge for you today, and it’s a challenge that is not necessarily for today. If you want to lift it up for today that’s fantastic, but it doesn’t have to be for today. And the challenge is this: One week in the next year, I challenge you to go to Mass every day for a week. OK? One week, sometime in the next year. It can be any time you want, but the one thing you probably could do today is put it on your schedule. OK? Go to Mass every day for a week, and just reflect on how you are different. Just reflect on how that affects you. Just reflect on how you see the Mass differently, experience God differently through the Mass during that week, because there will be differences. And you will find that the Mass nurtures you in new and different ways. It’s a great challenge. Will it be easy? No, won't be. Convenient? Absolutely not! If you want convenience you should stop trying to be a Christian right now. Absolutely nothing convenient about Christianity. Christianity is inconvenient because Christianity is love. And love is not about self, it's not about us, it’s not about what we want, it’s not about those things. Love is about getting outside of ourselves, laying down our lives for other people and that is difficult and inconvenient. And that’s love and that’s Christianity. But I promise you, if you make the effort, go to Mass every day for a week, your life will be different in wonderful ways. Once you understand that God has an incredible dream for you, once you grasp that God wants you to become the-best-version-of-yourself and help others to do the same, and once you start to listen to the prayers of the Mass with all this in mind, you very quickly discover that there is genius in Catholicism. Go to Mass twice this week, Sunday and any other day you like. Pay attention to how it focuses you and fills you with peace. Jesus, thank you for inviting me to spend more time with you. Fill that time with your grace, love, patience, and peace. Today’s personal reflection features Dynamic Catholic team member Sheryl Wood. Sheryl is one of our accounting associates. She comes to us from Denver, Colorado. Sheryl has played the piano since kindergarten, learned to scuba dive in Hawaii, and has been on two pilgrimages in the last three years. 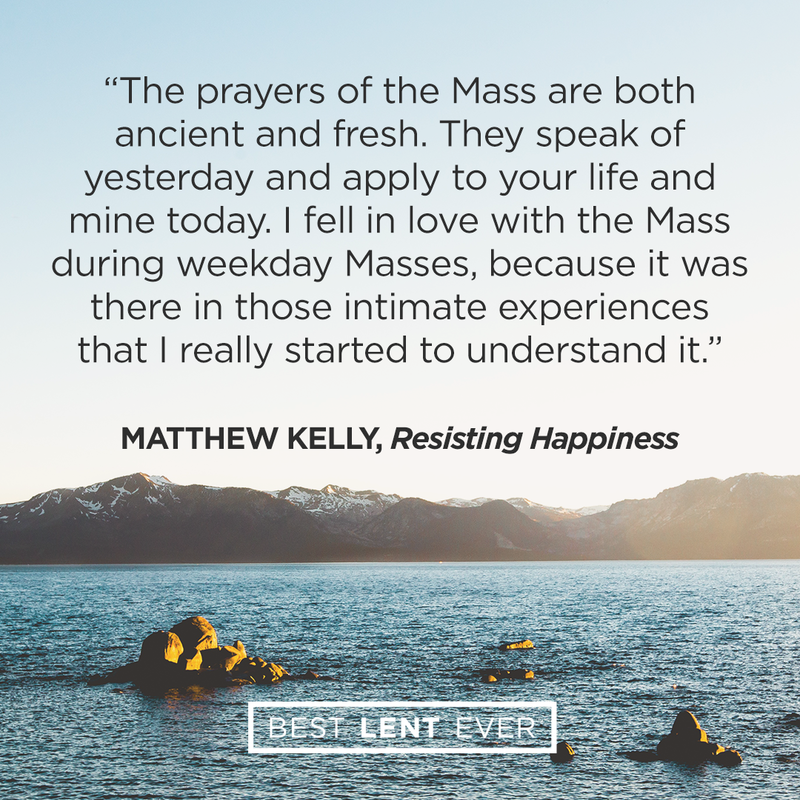 How has daily Mass impacted you?